Train of Thought Productions spoke to our Film Officer here at Highlands of Scotland Film Commission, Lawrence Sutcliffe, to explore exactly what is involved in getting Scotland on screen. Read the interview on their website here and take a look at their projects here. From Scotland’s gothic capital to the Highlands and Islands Scotland has provided dramatic scenery for nature documentaries and atmospheric cityscapes for a wide range of productions. The people that help make all that happen have spoken to us about the world of the film office. Your job title is Film Officer for the Highlands of Scotland Film Commission. Can you explain what this means on a daily basis? I am the film officer at the Highlands of Scotland Film Commission (a part of the Highland Council). I am the primary contact for productions looking for locations in the north of Scotland, offering advice and information that will hopefully convince productions to choose the Highlands for some or all of their location work. Ultimately my objective to facilitate inward investment from the media industry and foster a film friendly atmosphere for visiting companies; an objective that we share with the other regional film offices across Scotland. What is the view from your office like? I work in a large open plan office environment; unfortunately my desk doesn’t have a view of the windows. Urban greenery would perhaps best describe the view if I did have one. How far does your area cover? What sort of locations does this include? The Highlands cover one third of Scotland (approximately 10% of Great Britain), an area nearly the size of Belgium. This is comprised of the mainland, the Isle of Skye and a number of other Inner Hebridean islands. The Highlands is a largely rural area, and in many ways it perhaps represents the traditional vision of Scotland that most people have. Glens, mountains, lochs and coastlines all figure prominently our locations portfolio, but heritage (castles) and light industrial (minor ports and harbours) locations can also be found in our area. Our biggest weakness is probably our historical lack of a heavy industrial sector in the area, but this is more than offset by having a number of iconic Scottish locations within our boundaries: Loch Ness, Ben Nevis, and Skye for example. Locations often stand in for other places/other times – what is the most surprising location that your area has stood in for? The unique and dramatic landscape of Trotternish Ridge and the Quiraing of northern Skye have been used on a number of occasions to represent fantastical other worlds: the Harry Potter films, Stardust (2007), and The BFG (2016). On a more terrestrial level the Highlands have been the American northeast during the dark ages for Valhalla Rising (2009) and medieval Japan in 47 Ronin (2013). What are the most commonly asked questions that your office deals with? Outside of specific location related questions, such as ownership/management, the two areas that we are asked about the most are associated with roads and accommodation. 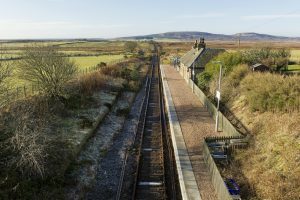 Being a large, and largely rural area means that the Highlands does not have the dense and varied road network one associates with modern urban development. Because of this it is not possible for us to offer full road closures for filming, a closure that might add a few hundred meters to a journey in a city could easily add fifty or sixty miles to a journey in the Highlands. Instead we offer controlled traffic stop and go, which nine times out of ten is an acceptable compromise. Where can we accommodate our crew, is the other big question. Tourism is a very important aspect of the Highland economy and there are many accommodation providers but these tend to be small hotels and B&Bs and productions often prefer to have their crews grouped quite closely. Add in the general popularity of the Highlands as a tourist destination, and suddenly the difficulties in finding 70 beds for three weeks with only a months’ notice become readily apparent. Is there a genre of production that tends to work with your office more than others? Films and large television productions are great for headlines and promoting the area, but these are the exception and not the rule. Commercials, photo shoots and small scale television shoots are the most regular visitors to the Highlands. Car and whisky commercials, clothing/fashion shoots, and natural history programmes tend to dominate these areas. What’s the most unusual request your office has had? More outrageous than unusual but one company asked if they would be allowed to detonate a large quantity of explosives in an area they knew was designated as being of natural and historical significance; a pretty easy no that one. For filmmakers approaching location work for the first time what advice would you give them? Time, the earlier that you can make contact and start discussions about what you want to achieve the easier it will be to make these happen. Are there other resources that you offer? We have an online Production Guide of Highland based individuals and companies working in or for the media industry. I studied film at university and went on to do post-graduate work in film archiving. Later, unable to find work in archiving I volunteered at the film office for a few months to gain some new experience, then a short period as a sub-contractor, and finally a new post became available which I applied for. For someone interested in working in this area what kind of skills and qualifications would you like to see in a future colleague? A sound knowledge of the production process and the various roles within a production company. You don’t need to have an actual production background yourself, and it should be noted that a regional film office isn’t really a route into production; although you may make a lot useful contacts over time. My colleagues over the years have tended to come from economic development and tourism backgrounds. A broad general knowledge of your area in geographic and historical terms is helpful, as is a familiarity with basic architectural styles. And, learn how to map read! New technologies have made many new mapping services easily available, and in an urban environment they are perfectly adequate but in a large rural area many important features simply do not appear. In fifteen years I have found nothing better than a good old fashioned Ordnance Survey map. It is seldom dull, as with any job there are routine elements that crop up time after time but there are also fresh components to almost every new enquiry that we receive. Also, I enjoy those occasions when an advert, TV show, or film appears in later months or years and I get to think, I help make that happen; and very occasionally you get to see your name in the credits and that is a lovely feeling.